Introduction: Just when I thought I had finally tested and written up my last Zillion article Daiwa introduced yet another addition to what has become their most prolific baitcaster series. The Type-R is designed to be the most sophisticated Zillion yet and is a natural replacement for the Limited Edition Anniversary reel. The Type-R makes use of some additional tuning components that increase both the performance and price of this sleek new reel. Impressions: Through the last few years the Zillion series has quickly risen up to become the workhorse series for Daiwa, yes there are cheaper reels in the company�s lineup but none are quite as balanced as the Zillion reels when it comes to refinement, performance, and overall value. These reels are employed by both weekend warriors and pros alike, and for many fans of the original Daiwa TD-Z reels the aluminum bodied Zillions represent the ideal everyday reel for the complete range of freshwater applications. Daiwa further expanded the original lineup with the introduction of the Zillion Coastal 7.3 reel two seasons ago and last April when I concluded that write-up I was sure I wouldn�t see another Zillion that was different enough to warrant yet another review. 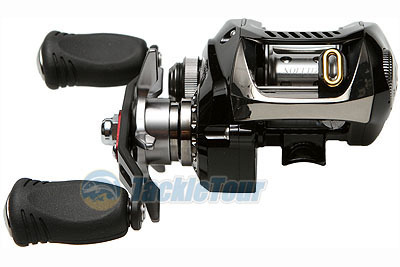 At the 2010 Classic Daiwa teased attendees with talk that they would release a new black finished reel. At the time I speculated that this new reel might be a composite bodied baitcaster that made use of the company�s Zaion construction, but shortly before ICAST the company officially rolled out the Type-R. 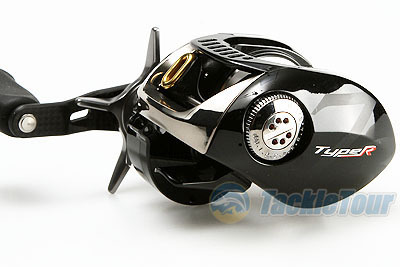 The very first reels were made available at Tackle Warehouse and the limited quantity on hand quickly sold out. 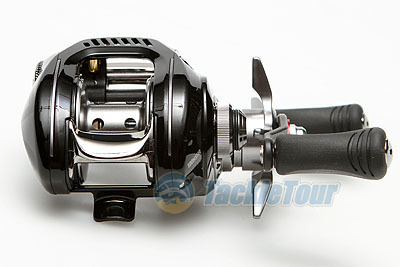 We didn�t get one of the initial reels and had to wait for stock to become available, which was well after ICAST 2010. At that point we placed an order from Tackle Warehouse and eagerly awaited the delivery of the Type-R. Was this reel just a pimped up Zillion, or was there more to this reel than just fancy cosmetic enhancements? Once spooled with Daiwa Samurai braid Ms. Casey helped deliver the reel to the TT lab for further inspection. 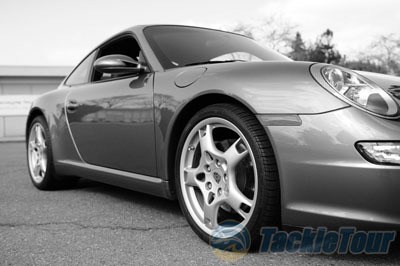 It was only fitting that she transported the reel in a fast car, this is the speed demon of the Zillion lineup after all. Like the Coastal the Type-R features a 7.3 high speed retrieve ratio and is capable of winding back a whopping 32 inches of line per handle turn. The handle on the Type-R differs from all other Zillions and while it is still swept in design it features a true carbon fiber construction, not some cheap carbon finish but actual carbon weave which is sandwiched and cut. The reel features a painted black finish which further separates the reel from the rest of the series. On the non-handle side anglers will find a large 7.3 marking as well as the Type-R logo, this gives the reel a sporty look yet is stealthy enough that it doesn�t distract anglers from the clean lines of the reel. Enough about the cosmetics, it is time to see just how this new baitcaster performs in the field.